The Hungarian name of this day, Vízkereszt, refers to “baptizing” the water. The holy water was believed to have miraculous power to heal. A non-Christian tradition is also linked to January 6 was predicting the weather. According to a saying connected to this day, "If water glints in the rut on Epiphany, short the winter will be." In Hungary we have no tradtion of the Epiphanies Cake so I have no childhood memories of that. I got to know this tradition 7 years ago when I moved to Switzerland. 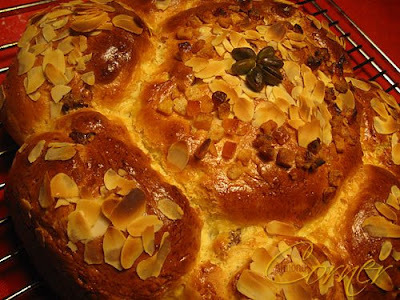 Today was the first time that I baked my own King Cake -that I submit to the event: Make your own King Cake hosted by the kochtopf-, using an almond as the king. Usually it is eaten for breakfast but for us it is going to be our dinner, so it is still open who is going to be this year's king. Heat milk until lukewarm and pour it over the sugar and yeast. 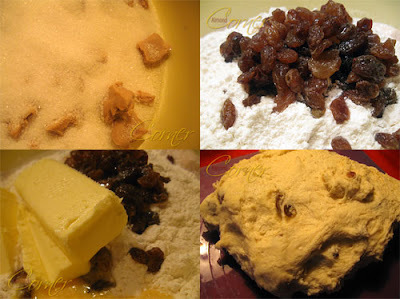 When yeast swims on top add salt, flour, butter, milk, in rum soken raisins, half of the egg and knead a smooth and soft dough. Let it raise for an hours. Place a piece of the dough aside (that is going to be the middle of the cake) and form small balls out of the rest so that you have enough to put around the main piece. Hide almond in one of the pieces. Let it raise again for 30 minutes. Smear cake with the rest of the egg and sprinkle sliced almond on it. Bake for about 40-45 minutes on 180°C. Der sieht zum Reinbeissen aus! Ich bin gespannt, wer König oder Königin wird. 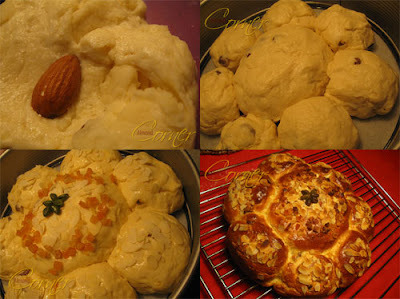 A delightful brioche bread! Really wonderful!